Professional Development: The core ingredient for career progression. What’s the core ingredient of developing as a professional? Need to stand out as the go-to-professional in your field? Professional Development is key, Reflection its core ingredient. Are you a natural Reflector? Tell me I’m wrong. Tell me you DON’T know one of those people who just keeps making the same mistakes over and over. We all know one. Eeek! In fact we can probably see that person in ourselves… now, a few years ago, as a naïve teenager many (many) moons ago … and they all have the same thing in common: they more than likely have never studied the process of reflection, or learnt how to do it intuitively. Is reflection really that important? Is it something we should be practising on a daily basis? Is it something that can really affect our development as professionals? The short answer is ABSA-FREAKING-LUTELY. What is reflection in a nutshell? It’s looking at the patterns that occur in your life (be they good or not so good) and working out why they happen, and how to either keep that pattern going (for the good stuff!) or how to avoid it happening again (for the not so good stuff). The problem is, once you’ve started making reflection a major part of your life, it’s fairly hard to go back. And the problem with that you might ask? Well you soon realise that there are two types of people in the world, and you can only be one type at any one time. Developing as a professional involves being one of these types of people. Care to have a guess which one? 2. There are those who know it exists but aren’t interested in going there or think the whole thing is a bit too ‘woo woo’ for them. Let’s call these guys ‘Non-Reflectors’. Neither is right, wrong, better or worse. So the thing you start to realise when you’re a Reflector, is that it’s really hard to work with, or build deep relationships (personal or professional) with those who are Non-Reflectors and vice versa. They often end in chaos; misunderstandings, arguments, an inability to move forward on paths which are anywhere in the same direction. Reflectors will often unconsciously band together in workplaces, as will Non-Reflectors, and you’ll see why in the coming paragraphs. Think back to past workplaces now, and think about the kind of people you tended to hang around. Hold that thought. More explanation to come. When you realise this division, a lot of your personal and professional relationships start to make sense. Think which category you fall into. Think about the people you’ve fallen out with (or drive you buts on a regular basis). Are they from the same ‘type’ as you? are the type of people who can’t or won’t address recurring patterns of behaviour. They’ll stick their head in the sand and do the same thing over and over, get less than satisfactory results, and never realise they’re at the core of their problems. They’re probably also the type of professional who continually gets poor feedback, alienates people or and doesn’t really do much to address the source of the issues. They may also be the type of person who often has issues with or argues with everyone else in their workplace – and more often than not, they’ll always be ‘the victim’, the one who has been wronged, definitely NOT the one whose fault it is for whatever negative thing is happening at the time. The pattern will repeat in every workplace they end up in, or if they’re in their own business, the same sort of issues will keep occurring with clients or customers. Who wants to live or work with people who are broken records, and constantly living with drama? Not me, and I’m assuming if you’re still reading, not you either. more than likely find themselves getting a bit shirty with Non-Reflectors, because they can SEE that these Non-Reflective people are in a loop, and that it’s only THEM that can get themselves out of it (but they continually choose to sit back and complain about it instead). In the workplace, Reflectors may sit listening to Non-Reflectors going over the same old same old, day in day out, and eventually it just starts to sound like wa wa wa wa wa poor me. Hmmm. The same goes for personal relationships, or if you’re working with clients. Ever felt that way while listening to someone and just thought ‘MAN I’ve heard this so many times now when are they going to realise it’s a pattern?’… hmmm. You might also find yourself repeatedly thinking or saying things like (to yourself, or to the Non-Reflectors, whenever something not so positive happens), ‘Well what are you going to do about it? What’s the lesson in this? How’s this going to change what we do next time?’. who will actively seek feedback from their clients, deal with it head on, and become better professionals because of it. Professional Development is all about coming to terms with parts of our behaviour, performance or skill sets that could do with improvement, then setting about making it happen. It really just boils down to whether you’re the kind of professional who wants to keep getting better at what you do – or whether you’re happy with where you’re at. So what’s the core element behind developing as a professional? Learning to ask for and grow from feedback both good, bad and ugly, or in other words, being a Reflector. Unlike the proverbial leopard, Reflectors can and often DO change their spots. Non-reflectors tend not to. It’s as simple as that. Maintain deep relationships with the same ‘type’ as yourself and you’ll tend to find that that is the sort of professional you’ll grow to become. What’s your professional network like? Who do you surround yourself with? Are you ready to grow as a professional? Learning to ask for and deal with feedback, is the core to moving forward in your professional career. If you’re not convinced it’s worthwhile or that it’s an important part of your development as a professional then there’s really no point in reading on. If you’re on the fence or agree it is an important part of moving forwards, stick with me for another few paragraphs because after this story you’ll find it hard to ever go back. The power of Reflection can be life changing. As a teacher of ‘Reflective Skills’, I’ve seen it time and time again; young kids becoming adults in front of my very eyes, hardened adults learning things about themselves they wished they’d known 20 years ago. Take this story for example. So I’m teaching a bunch of first year university engineering students ‘Foundation Skills’ and we’re at the point where we have to start discussing ‘Reflection’ and how the process is vital for a professional in terms of being able to learn from past experiences good or bad, and how to turn those experiences into positives for the future. Imagine, a group of mainly blokey boys, engineering students, having deep and meaningfuls about reflecting on their past experiences. Not likely! Not surprisingly most of the boys were fairly reticent towards the whole process but there were a few who engaged and started sharing their revelations in class. The revelations were on topics far and wide, some predictable, others not so much but the prize went to a young male student who for most of the term had been quiet, introverted and unable to effectively participate in group work assignments. His reflections showed a deep understanding of the cycle of reflection, focusing on all areas of his social and academic life. He was able to take many negative experiences he had had in the past and turn them into positive actions which would improve his future. For a teacher trying to connect to a group of teenage engineering students, it was a small victory and I hoped that the rest of the class could learn from the amount of personal reflection and growth that this young man had gone through. He had become a student who was not only involved in team activities, but had started to voice his opinion, come out of his shell, and excel in group presentations and assignments. The change was not only noticeable but truly remarkable. Towards the end of the term that I received this note from ‘Jack’, addressed to me, as his final reflection. Thank you. Throughout this semester I have begun to find an appreciation for reflective writing. Practicing this simple technique has enabled me to look at myself and work on aspects of me that are lacking in my study and in my behaviour. What is most pleasing is that it’s almost like going to see a therapist but without the hefty price tag. I have learnt so much just out of this one unit and the lessons gained are going to enable me to become a better scientist and a better person too. Last year was a weird year for me as it was the year that I told my family I was gay. This one little secret that I kept all my life was the sole cause for all the faults and flaws I have discovered about me. Being scared of who I really am has made me depressed and angry at times as well as very short tempered and sad. With this burden on me throughout my last degree I lost focus on my study. The ‘reflections’ I’ve done in this unit in a backward way have shed light on the fact that since I’ve come out I need to rid myself of these excess ill feelings towards myself and others. I’ve learnt that reflective writing is a great way to express how I feel and is a wonderful way to rid stress. The Communications Workshop also is the very first class that has enabled me to be myself and actually really enjoy learning. Even being used as a guinea pig for a classroom exercise was an experience I’ll be forever grateful for as it enabled me for the first time to combat my public speaking demons. I used to hate oral presentations but now I kind of look forward to them. At the end of it all I’m going to miss this Communications Workshop. I never thought I could find this unit interesting but Maria’s made it happen for us. I made a lot of friends in that class and that is also testament to her great teaching as she made us interact with each other. I’ve never been a ‘people person’ and I always have struggled to make friends mainly due to self esteem issues and those issues mentioned earlier. But to deal with these problems and to face them each week through doing the reflective writing exercises, has been enlightening and so helpful. Finally after all these years studying I can actually focus on studying and not on who I am or what I need to be. All thanks to this Communications Workshop – thanks Maria! It’s been a life changer! The power of reflection…. huh? Ready to learn how to reflection so that you can use any situation to your advantage? You can use it to improve on any teaching and learning experience (good or bad) so that you can develop as a professional and your content can improve every time you deliver it. You can also apply the process of reflection to any life event, personal or professional, so that you can always create a more positive outcome that you experienced the first time around. Reflection is a process. It’s similar for experiences that are positive and not-so-positive, and it’s a process that needs to be repeated time and time over, until it becomes a natural part of how you process your feedback. When you master the art of Reflection the way you look at everything that happens to you, changes, for the better. Things don’t ‘happen’ to you anymore, you’re faced with an opportunity for growth, and that’s always a good thing right? 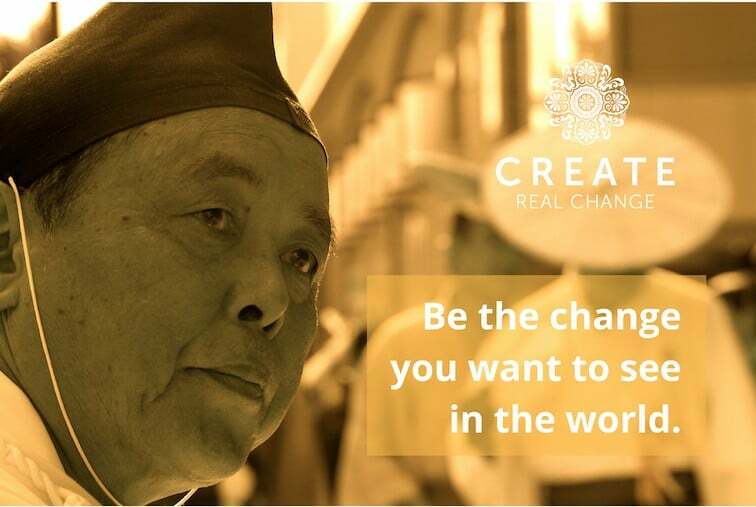 This is one of the core practices I use in my Monthly Masterminds and Content Creation Getaways in Bali, so if you’re looking to see it in action, get along to some of the training and see for yourself how powerful it can be! I’ve also prepared a low cost, online tutorial and a worksheet that outlines exactly how to go about it. Click on the above link to be taken directly to the Lesson. If you’re already a member of the Continuous Improvement course, make sure you’re logged in! If you’re not, you’ll be redirected to the page where you can become a member. 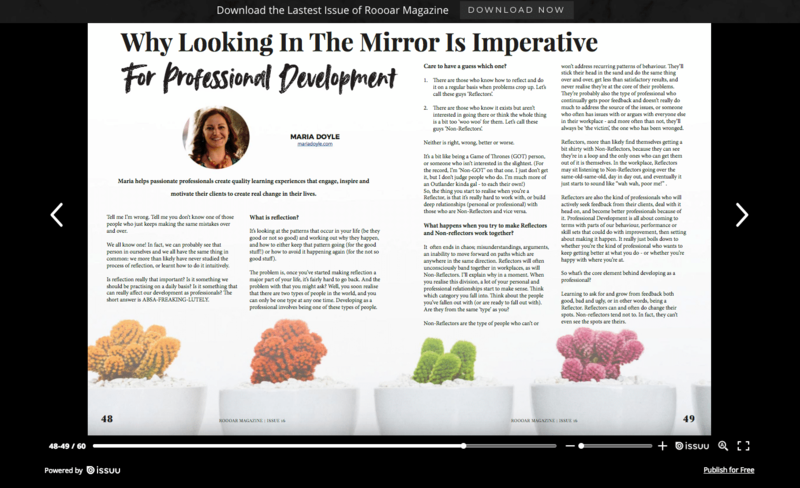 This article was published in Edition 16 of Roooar Magazine, November 2017, with the title ‘Why looking in the mirror is imperative for professional development. 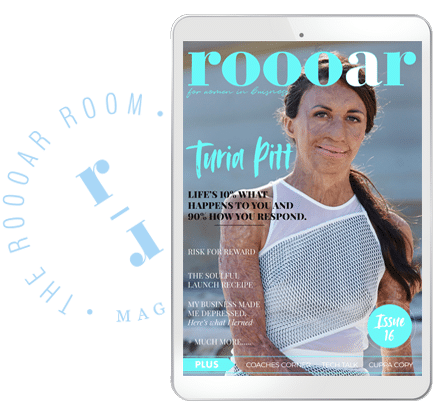 Download the magazine here. ← Why am I publishing these stories? Very moving story. You must get such satisfaction out of your work. I really enjoyed this post. Thanks Maria! 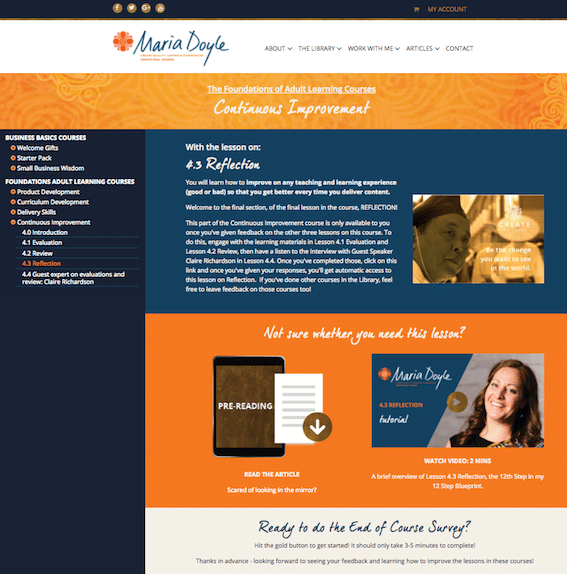 Well done Maria. And well done Jack. Love a good (and successful!) story. That is a fabulous story and a reminder how important reflection is. The beauty of the story is that drop in the ocean causing a ripple effect, touching many more. Thanks Tanya and Marijke! Yep, it’s the sort of training that you wish you could do full time – you see so many positives come from what individuals learn and how that then changes relationships with families and friends – truly rewarding work to be doing! Wow Maria, that was very inspiring. That young man will always be grateful. Accolades to you, and your supreme way of handling situations in making people aware of their treasures, and what they achieve by exploring them. You should have been a lawyer, sorry I ever put you off, it was the truth though. Beautiful that you showed your support for your inspiring daughter here on her website, as I’m sure you also do in person. She’s changing many people’s lives for the better – and I’d guess from her vivacity, her own too.